Does your dog skip or have trouble walking? From time to time does your dog skip on a back leg? Or perhaps they hop a few steps and then run perfectly fine. A common reason for this skipping gait is a loose kneecap; or to give it the correct name, patellar luxation. What is patellar luxation in dogs? And what’s the best patellar luxation surgery? Of course, there’s more to lameness than wobbly kneecaps, so always get a diagnosis from your vet. But for those who already have a label of ‘patellar luxation’, but are puzzled about the implications, this is a great place to start. Don’t you love it when good plain English is dressed up in fancy terms? In this case ‘patella’ simply means kneecap, and ‘luxation’ means side-to-side movement. Hence how patellar luxation and wobbly or loose kneecaps are an interchangeable term. Why does loose kneecap matter? Rather than being there for ornamentation, the kneecap has a job to do. It provides a fulcrum, of pulley-point, on which the big thigh muscles pull. When the thigh muscles contract they pull on the kneecap which is anchored on the shin-bone (tibia). This causes the leg to straighten. Thus the patella has an important role in taking steps forward. But much like a pulley, if something slips out of place, things don’t run smoothly. In this case, it’s the patella jumping to the left or right of centre. Then when the muscles pull it’s no longer in a straight line but off to one side. This causes the leg to lock up and makes it mechanically difficult to straighten out. Hence the skipped step. If complications have set in, such as arthritis or cruciate disease. Again, best check in with your vet who can assess the severity of the luxation. Loose kneecaps are usually an inherited condition, rather than the result of an accident or trauma. Yes, there are strong breed links to this condition, which can be due to how the ‘look’ of the breed means they have short, bendy legs. In theory, affected dogs should not be bred from. This is all well in principle, but some breeds have such bendy legs that it’s hard to find a dog that doesnt have some degree of patellar luxation. That said, don’t feel smug if your dog is a mix or not one of these breeds. Any dog, large or small, can have patellar luxation if their have poor knee anatomy. A loose kneecap is a mechanical problem, down to angles and pulley systems. But for our dogs we’re not talking ropes and wooden blocks, so much as bone angles and groove depths. A shallow (rather than deep) groove for the kneecap to rest in. The lack of depth makes it easier to flip the patellar out of place. Any individual dog may have one, two, or all of the above issues, hence the severity of the luxation varies between dogs. Having a loose kneecap isn’t like being pregnant. It’s NOT an all-or-nothing condition. Some dogs have the merest hint of a niggly knee, whilst others are disabled by it. Indeed, when a vet assesses a patellar luxation, they will ‘Grade’ or assign a level of seriousness to the condition. This better allows them to work through which dogs just need pain relief and those that need patellar luxation surgery. Your dog is fine, and you probably aren’t even aware there is an issue. This is the luxation the vet finds as part of a routine vaccination checkup. The kneecap can be gently pushed out of place by a helping hand, but isn’t inclined to do so of its own accord. This is the dog that skips a step when walking or running, but it doesn’t slow them up any. It might happen once in a blue moon or regularly, but aside from the odd twinge, doesn’t bother them. This is the kneecap which naturally prefers to sit in the wrong position, but hasn’t fused there yet. 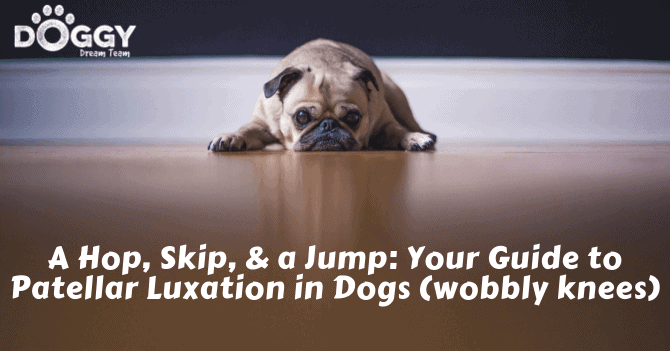 Lameness and knee pain are common, and can impact on the dog’s ability to jump or get around. This leg is permanently locked in the wrong position, and it’s really difficult to relocate the patella back to its rightful place. These dogs are often permanently lame on the leg and do require corrective surgery to keep them mobile. Anyone with a ‘clicky’ joint, appreciates an abnormal movement isn’t necessarily painful. The same goes for patellar luxation in the dog. In mild patellar subluxation (Grades 1 & 2) the problem is mechanical rather than painful. Much like putting a door wedge under the door, the knee is physically locked in the wrong position. That dramatic skipping, isn’t down to discomfort but due to the knee locking up. However, if the knee repeatedly locks up, this causes inflammation. When the inflammation is severe enough, this causes knee pain. Hence, why mildly affected dogs may need pain meds from time to time. Going back to the door analogy, if you repeatedly slam the door against the wedge, forcing it closed, eventually you damage the door. Similarly, for patellar luxation grades 3 & 4. The repeated insult leads to remodelled bone, early arthritis, and knee pain. These guys are sore, and it places extra strain on the other legs. Surgery is the best option to get these dogs back on their paws again. What is Patellar Luxation Surgery? There are several techniques for surgical correction of patellar luxation. The surgeon decides which patellar luxation surgery is needed by assessing each individual dog’s issues. Take the example of a dog with straight legs but the kneecap sits in a shallow groove. The lack of depth allows the patella to pop out of place. All that’s needed is to surgically deepen that groove and then the kneecap can sit tight. 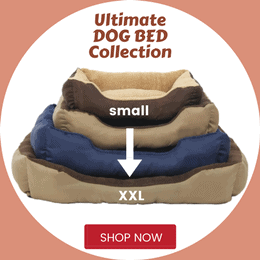 At the other end of the scale, is a dog with severely bowed legs. The forces pulling on the patella are all over the place, so simply deepening the groove won’t cut it. These guys need complex procedures to realign part of the shin bone. Tibial Crest Transposition: This involves breaking a beak of bone (the tibial crest) and reattaching it in a better position. The idea being to make forces on the patella pull in a straight line. For low grade problems most first opinion vets are happy to tighten the joint capsule and deepen the kneecap groove. The procedure needs to be done under general anaesthetic and usually costs several hundred pounds. For more complex problems referral to a specialist veterinary orthopaedic surgeon may be needed. Rebuilding the knee joint is complex and the costs can mount accordingly, into thousands of pounds. We have pet insurance guides that cover specific patellar luxation surgery cost relating to specifc breeds in more detail here. If you’re suspicious your dog has patellar luxation, see your vet. They can advise you as to the best way forward. In addition, look after the dog’s joints. You may wish to consider giving a joint supplement (chondroitin and glucosamine tablets are a good place to start) to make the knee more resilient. And for puppy owners of breeds at risk of patellar luxation, take out pet insurance. Then if the worst does happen, you can decide what’s best based on surgical advice rather than the depth of your pocket. Keep those tails wagging, everyone!